There is something about a reception being held in a barn that is both simple, yet elegant. 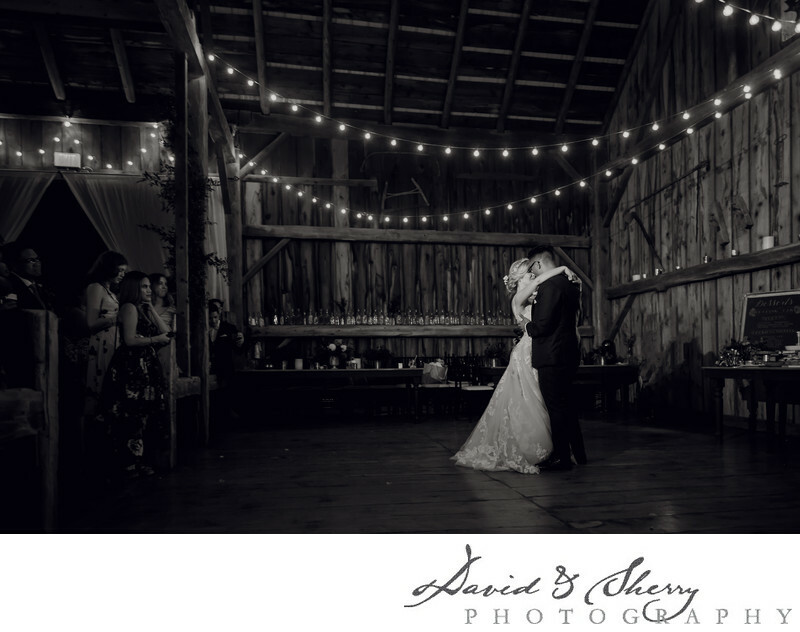 The glow of twinkling lights, the rustic barn board and the dimly lit atmosphere… these are all qualities of this classic location that make it romantic and appealing to both the guests and the happy couple. It was almost like a scene from a movie as this bride and groom danced on the old wooden floor, surrounded by flickering candlelight, as well as their closest friends and family. I especially enjoy the variety of lines and angles in this black and white shot, as well as the way the light hits the dress perfectly during their first dance. Most people might assume that the option of a barn wedding is limited to more rural areas, but that is not entirely the case. There are a variety of options to host a country-chic event if you are located in the Greater Toronto Area. Just a few of these luxe-rustic locations in the GTA are Cabium Farms in Caledon, City of Halton Museum in Milton, and Waterstone Estate & Farms in Newmarket. Each of these pastoral areas are extremely unique and glamorous in their own way, offering the ideal atmosphere for a charming and whimsical wedding night.